There are so many gadgets available in the market that promise to make your life easy. If you know to put them to use appropriately, then they may turn out to be extremely useful. Kitchenaid spiralizer reviews indicate that many users have found it a great addition to their kitchen. They have been able to reinvent their traditional recipes into modern cuisine with addition of fresh fruits and vegetables. This spiralizer lends an artistic twist to the otherwise boring meal. It is also a gadget which will encourage healthier meals. Fussy eaters, especially kids will like the artistically cut veggies and fruits in their meals. It makes life so much easier if you plan to host a party and you need a whole lot of vegetables and fruits to be cut. Also, cooking up a meal such as noodles, pasta, pizza is simpler with assistance in the cutting, slicing and peeling department. There are a whole lot of kitchenaid spiralizer recipes. You may have to include in your daily meal plan to make use of the kitchenaid spiralizer appropriately. Here we review KitchenAid KSM1APC Spiralizer. This product has been welcomed by many women as a great addition to assist them in their cooking. Versatile Blades – kitchenaid peeler attachment comes with peel, core and slice functions. This gives us different means of cutting various vegetables. It can be used putting up an artistic salad. The food will definitely turn out to be appealing for the eyes.There are 4 attachments that come for various purposes including coring, slicing and peeling. Infact, peeling and spiral cutting can happen simultaneously / seamlessly on the unit. Power hub attachment – You can easily attach it to the power hub and turn it on. You may need to use the manual to understand the functions of the kitchenaid peeler attachment Otherwise, it is a pretty simple gadget to use. Easy installation – This gadget is almost straight out of the box, you do not need great amount of assistance. There are five attachments which help you peel, core and cut vegetables and fruits.Depending on the cuisine and the cut that you require, you will have to choose the right attachment. You will have to fix it onto the mixer that you have, the plastic base can adjust and fit into any type of mixer.Then you will have to just switch on the power unit and get it running. It can run for long hours without any overheating etc., The capacity of usage is dependent on the mixer. The blade quality is superior which ensures, that the cut is consistent everytime. Universal fit – The gadget is designed to fit all stand mixer models, this makes it less cumbersome. You can buy it without the fear of the kitchenaid peeler attachment not being the right fit for your mixer. If you own a mixer already, this may be only a fractional investment which brings in great convenience.The addition of this gadget can be great especially if you need to cut vegetables and fruits as part of your daily routine. It can especially be very handy for people on diet, vegetarians and vegans. Metal Construction – The metal construction is of premium quality, this will ensure that it can be used repeatedly over the long term. The product will have to be wiped off clean and this will keep rust away.Also, the construction is quite sturdy; it can handle all types of vegetables and fruits. The metal construction is only for the blades currently, the base of the blade system, which gets into the mixer is actually plastic. Many users have found this feature to be a deterrent.However, the blade is made of high quality which can tear into tough cores. However, the blades need to be maintained and sharpened to ensure that the quality of cutting and peeling remains good over the long haul. Convenient Storage – The storage is quite convenient. It is a compact kit with multiple blades. It has to be stored in a clean dry place. If moisture and dust is kept away, the longevity of the kit can be enhanced.It is designed compactly, there is no specific storage requirement that is needed. Since it is to be used quite often, you may want to put it away close by so that it is easier to retrieve.You will have to have a religious cleaning routine, to ensure that it does not get rusted or spoilt by leaving with moisture. Multi tasking – The kitchenaid peeler attachment can multi task at the same time, it can peel and cut the vegetables spirally at the same time. This can be a great time saver. It is also a hands free operation system, thus you need not be around when you put it up for work.You will have to fix the vegetable / fruit and until it is done peeling, cutting. During such time you can tend to other works in the kitchen. However, you will have to change the fruit / vegetable after it’s done manually.You may also to watch out for bad quality vegetables / fruits being added along with the rest. When you cut manually, you check the quality. After the gadget heaps your vegetable / fruits, you will have to manually run a quality check. Negatives – Why you should NOT buy it? Some parts are plastic, which are prone to breakage if not handled with care. Also, these parts are likely to undergo wear and tear with repeated use. The blades need to be sharpened at regular intervals to get quality cuts and peels every time you use. With repeated use, the blades tend to become blunt, the results tend to be poor over the long haul. Tough cores of vegetables and fruits may end up causing damage to the fragile parts of the kitchenaidpeeler attachment. There is a need to breakdown the vegetables / fruits manually before you put it on the spiralizer. Users have found that the consistency of the vegetables and fruits is unimpressive. The vegetables come cut in various shapes and sizes. Universal fit makes it a great gadget to own irrespective of the type of mixer you have. It is also priced reasonably for the 4 different blade system that it offers. It can virtually do different cuts of vegetables and fruits. There are host of kitchen aid items available in the market. 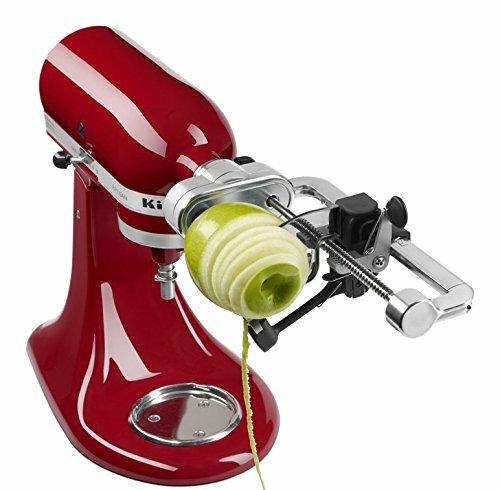 Kitchenaid spiralizer reviews indicate that this can make your life easier especially if cutting, peeling and coring vegetables and fruits is a daily task. It is especially a great addition, if you are a health freak. Also, for people on diet this comes in handy. They need not put manual effort to make a nice salad when they feel like having a snack. Vegetarians and vegans are dependent on fruits and vegetables for a host of nutrition that their body requires will find this product useful. If you already own a mixer, then this is merely some additional fund outlay. It can go a long way in helping you in the kitchen. 1.1 Negatives – Why you should NOT buy it?